There’s over 50 technology enhanced item (TEI) question formats available on ScootPad. Get started with using these formats and creating next-generation assessments for your students. 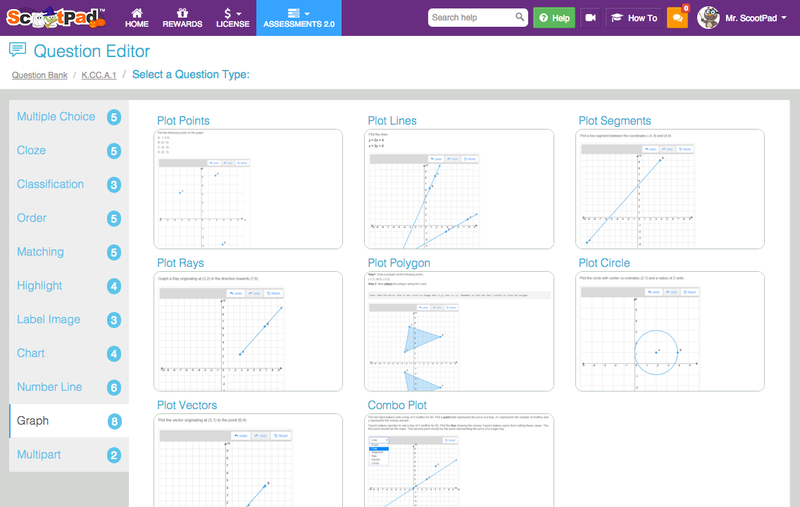 ScootPad is an “Open” assessment platform, meaning you can browse and use questions and assessments created by other teachers while you can create and share your own. TEI question formats allow students to solve problems in a more interactive and comprehensive way. For example, a traditional question format will ask a student to select the correct answer to the question. A TEI might ask a student to type out the entire answer and rearrange answer choices in a particular order, rather than just clicking on the bubble. TEIs are becoming increasingly important in prepping students for summative testing in the spring as big assessment consortias like SBAC and PARCC are aiming to be entirely computer-based. Students will be able to practice the same level of rigor and technology used in the next-generation assessments with TEIs. Teachers will also be able to precisely assess and identify students’ needs to develop a more targeted instruction before they must take the summative assessment. So, what about ScootPad’s TEIs? We’ve developed all formats expected in the next-generation online testing and even released unique formats that are yet to be presented in assessment consortias like SBAC and PARCC. That means students will be able to experience even more ways to solve and interact with problems. Our question formats fall in several categories: multiple choice, cloze, classification, order, matching, highlight, label image, chart, number line, graph, and multipart – as shown in the image below. Educators can create questions and assessments under any grade, any subject, and any standard. 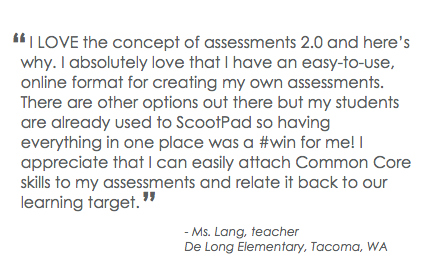 In addition, educators can now share their content with the ScootPad community. The question and assessment banks allow educators to collaborate, rate, and reuse all shared content – making content more readily available and usable than ever. 1. You can create your own questions by going to Assessments 2.0, located on the top navigation within your account. 2. Then click on the My Own Questions tab. On this page, there will be a green button on the top right labeled +New Question. 3. Choose a question format you’d like to use. Simply enter your question stem, answer, DOK level, scoring (the number of points), and the standard(s) being assessed. Preview the question on the right and make sure to test to verify that it works. Save the question and assign it to students. You can also watch a quick 1 minute video to see how you can create questions using each of the question formats. Here is a sample 1 min video on how to create a “Highlight: Circle Shading” type question. Highlight: Circle Shading from ScootPad Corporation on Vimeo. How to find questions from the open content bank? We encourage you to browse through the Question Bank and Assessment Bank, and check out the content created and shared by the community. Click the “Open Content” option under Assessments 2.0, located on the top navigation within your account. For step-by-step instructions, visit our help center by clicking here. We welcome you to try our question formats and give us your suggestions for any new question formats. We are on a mission to create the MOST comprehensive Open assessment platform and we can certainly use your help to make that possible! Feel free to start a live chat with us or shoot us an email at support@scootpad.com or call us at 1-800-994-0706.